There are few things that get me as excited as a new premium match-three game free of ads or in-app purchases (IAPs). I even made a list of my favorites here. 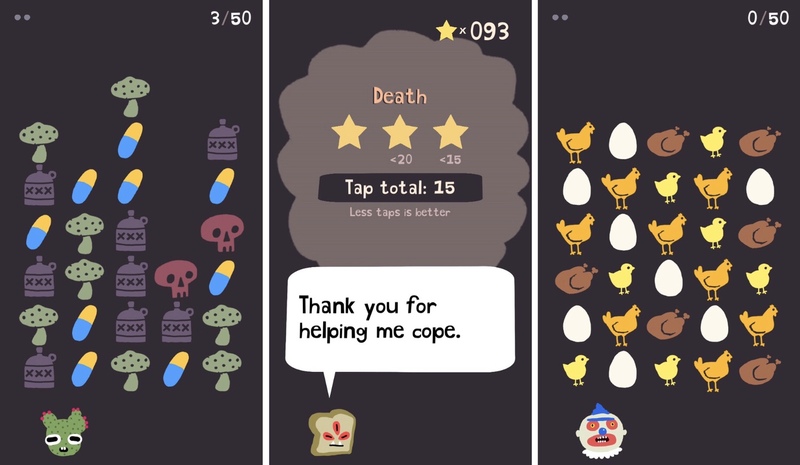 So when I saw DR.MEEP appear in the pre-order section of the App Store and noticed it was by none other than Hyperbeard, the makers of Muertitos, I knew I had to play it. The quirky concept and artwork only magnified my excitement. So coming into the game, every fiber of my being wanted to love it. Unfortunately, after spending a lot of time with the game, I have some mixed feelings. Continue reading to find out why. First off, I love the weirdness of the game. You play as DR.MEEP, a psychologist to some oddball characters such as Dimbo the clown, a three-eyed slice of toast, and even an orange creamsicle. They each have their own individual problems they want you to help them solve. Mr. Muffers is only in therapy because his work made him go to anger management. Miss Sheepy has an unhealthy relationship with food and Cactus Joan’s mom threatened to stop paying her rent if she didn’t see a psychologist. There’s a lot of humor in the game while also being very relatable at times. I liked how each character has its own story, something not too common in match-three games. But every game lives and dies by its gameplay. The core idea in DR.MEEP is a strong one and one that really should work a lot better than it does. Each character has five levels to play through, getting increasingly difficult with each one. Each level starts off with some pieces on the board in rows. You might just have some simple circles, triangles and squares, each shape having its own color. In the upper righthand corner is a counter that tells you how many pieces you have to match to complete the level. Like any match-three, you need to make matches of three or more of the same item. But instead of swapping pieces, you tap on one to get rid of it and everything above it will drop down once. The catch is, your taps are being counted and new pieces fall from above either on every other tap or, in some instances, every tap. If anything climbs higher than the top of the screen, it’s game over. And besides worrying about the piles getting too high, you’re rewarded stars at the end of each level depending on the number of moves you used. That all might not sound too hard, but what about when you have things like pizza that uses up two taps to consume? Or tombstones that can only be gotten rid of by matching? There are even skulls that kill you instantly if you aren’t paying attention and let three line up. When you meet Ronk the dog, you’ll only get credit for matching bones. Some of my favorite mechanics are the mushrooms that, when tapped, turn the pieces to the left and right of them into mushrooms. 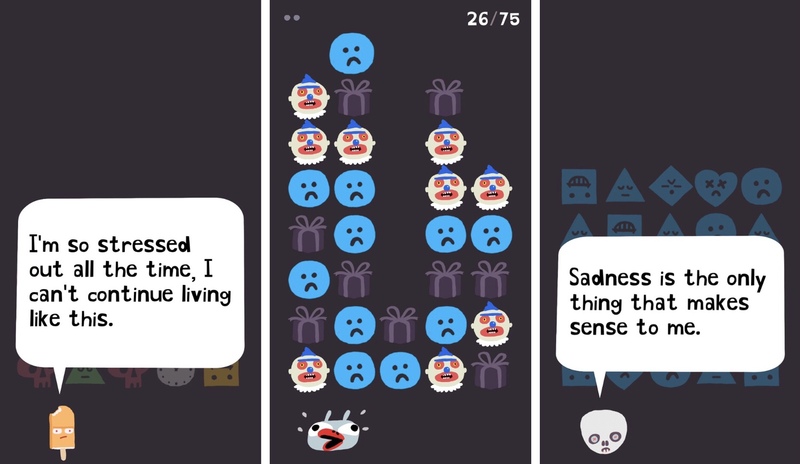 The pills are seen in the same levels and instead of disappearing when you tap on them, they eat up the piece above them. This may seem trivial except for the fact that they appear in the same levels as jugs that can’t match at all and take two taps to remove. So your best bet is to leverage the mushrooms and pills to keep things manageable. Another character has you matching eggs and chickens and when you tap on them, they change to the next phase, such as egg to chick and chick to chicken. Then later, frying pans are added to the mix that cook any eggs or chickens in the column. So as you can see, not every mechanic makes things harder, but the fifth level for a character is usually much more difficult than the first, and trying for three stars can feel impossible at times. I want to reiterate that there are a lot of great ideas here. But the game can get frustrating due to a few design choices and may cause all but the most persistent players to quit. First off, there are no real instructions ever. When new pieces are added, it’s up to you to experiment with them and see what they do. In fact, I missed some obvious ones at first simply because I was so focused on getting rid of the skull tiles or just got too overwhelmed to really pay close attention to what was happening with specific pieces. It makes me wonder if each level has a very specific strategy to complete it quickly and I’m just too dim-witted to see it. But without knowing that, the game as a whole seems too reliant on luck. Each of its mechanics work really great as part of a puzzle game, and I think some hand-crafted puzzles using these mechanics would be perfect. But the randomly generated boards make it hard to tell if my successes came from good strategy or simply from luck. Take, for instance, the images below. They’re each starting positions for the same level. Depending on which one you get, you’ll have a leg up. 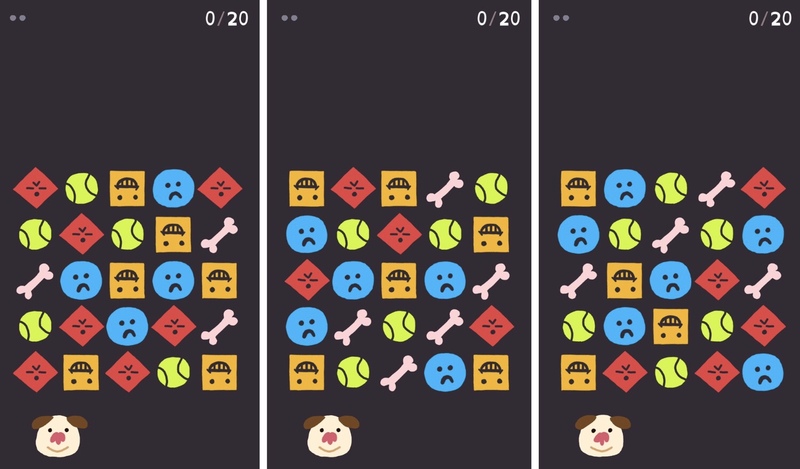 In the first image, you can get rid of a bunch of tiles with just a couple of taps, in the second you can already collect three bones with just two taps, and the third one will require more taps to get either three bones or more than one match. On top of that, you don’t know what tiles are dropping next, so you’re playing somewhat blindly. You may get rid of one tile because it’s a loner, just to see the next batch of tiles would have made an easy match with it. It’s hard to plan for things you can’t see. That said, it’s not a deal-breaker, as plenty of games ask you to make tough choices without having all the information in front of you. I think the problem is that it’s all these things on top of each other. There are times where the game feels perfectly balanced and I’m thoroughly enjoying myself — like the chickens or mushrooms. But there’s equally as many times where I’m just restarting a level over and over hoping for better luck. There’s still a whole bunch of levels I haven’t three-starred yet because it seems near impossible, as well as a few levels I simply haven’t completed at all. One of my least favorite is Sampson, because his emotions are almost all the same color. On the one hand, I now know how colorblind folks feel playing games that aren’t built around them, which is kind of neat. On the other hand, it’s not a great feeling and it makes the puzzles uncomfortable and eye-straining instead of fun. I have to exert too much energy and focus on telling the pieces apart before I can start choosing which ones to get rid of. I’m not sure exactly what I would change about MR.MEEP to make it more enjoyable and less frustrating. There’s a lot to like here and it’s obviously a work of passion. I so badly want to love it and I wish it constantly pulled me in instead of pushing me away. But for every level that feels satisfying to complete, there’s another that I’m endlessly restarting in the hopes of better random generation. The mechanics are clever, but at times it’s hard to appreciate them because the playing area is so constrained. So while this might not be my favorite match-three ever, I would love to see something else built on these mechanics. And I also appreciated that you unlock new characters with stars instead of strictly linearly, so at any point you may have several levels to work on if one is causing you trouble. It does make the game easier to handle, as if I got stuck on a level and had no others available, I might have quit a lot sooner. At the end of the day, I’m not sure whether or not to recommend DR.MEEP. I want to just because it feels so different and unique and there is fun to be had here. But my frustrations with it leave me hesitant to put others through the same. I think my best advice would be to pick it up if you’re at all curious, but know ahead of time that it will require patience to both learn its mechanics and to not give up after multiple failures. 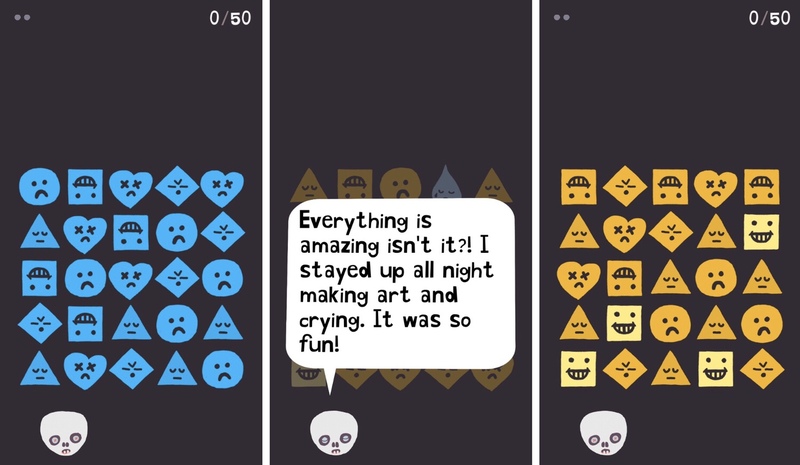 While it is turn-based and therefore relaxed, it is not a match-three you’re going to play half asleep in bed. It’s challenging and infuriating at times and I’m sure there are players out there who will absolutely love what it offers. Just make sure you’re that type of player before you dive in. If it sounds like something you’d enjoy, grab the game here and let the doctor mess with your head.